This entry was posted in Canada Canada Immigration and tagged Manitoba Province Manitoba Provincial Nominee Program Province of Manitoba Skilled Worker Immigration Program Skilled Workers in Manitoba on June 7, 2016 by Blog Author. The province of Manitoba is one of the three Prairie Provinces, along with Saskatchewan and Alberta. If you are adventurous, love greenery and wildlife, we found the right place for you. From modern infrastructure to grasslands, this place has it all and the weather can vary from 30° C to -40° C.
If you meet the requirements of Manitoba Provincial Nominee Program (MPNP), you get a Manitoba Provincial Nomination Certificate that will accelerate the immigration process. You can apply through one of these three programs. Choose the option that suits you the most. If have the qualifications to make an immediate contribution to the economy of the Province of Manitoba, you can apply for this Program. If you are a temporary foreign worker or a student in Manitoba and have a permanent job offer then you can apply for PR in this province. 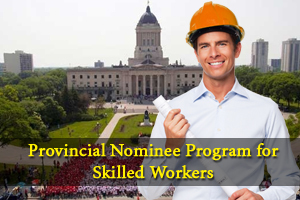 You can apply for Manitoba Provincial Nominee Program if you have family or friends who can sponsor you or have studied or worked here in the past, or was invited by the MPNP. You will be assessed on five factors to qualify for this option – age, education, English proficiency, work experience, and adaptability. A sparsely populated province, Manitoba is ideal for starting a business as there are abundant opportunities. The Province of Manitoba and Government of Canada are equally responsible for international business people who migrate to Canada through the Provincial Nominee Program for Business. Manitoba can nominate you if you qualify to set up a business or purchase one. There are numerous options available for you if you are interested in settling down in Manitoba. There are immigration programs offered by the federal government as well from the provincial visas. The Federal Skilled Worker Program, Express Entry, and Family Sponsorship are some of the other programs which not only grant access into Manitoba but even into every other province in Canada. You can visit our website morevisas.com or visit our center so that we can guide you through the entire immigration process.